The Belly Flops water toys from KONG provide your dog with lots of fetching fun. The starfish and octopus are highly suitable for games by the water, because the toys float. Every colourful toy contains a squeaker. 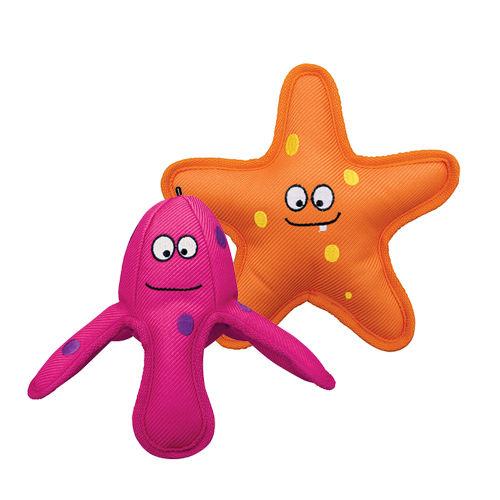 The starfish and octopus Belly Flops from KONG provide lots of entertainment for your dog in the water. The toys are highly suitable for use by the water, on the beach or during water play, since the colourful toys float on water. The squeaker in the toy challenges your dog to play for longer! Only allow your pet to play with the Belly Flops dog toys under supervision. Have you used KONG Belly Flops before? Let us know what you think about this product.